Your precinct captain just assigned you and your partner a seemingly impossible mission: traveling back in time to the 1960s and infiltrating the criminal organization of San Francisco's biggest drug boss. While we can't help you with the time machine (or figure out why your police captain wants you to time-travel...), we can definitely help you go undercover and get into the role. Since you're going to a super-groovy time and place, you're going to need to wear something that celebrates the free-spiritedness (and free love) of the era. So before you head out on your mission, make sure you're wearing this Men's Plus Size Sunny Hippie Costume! 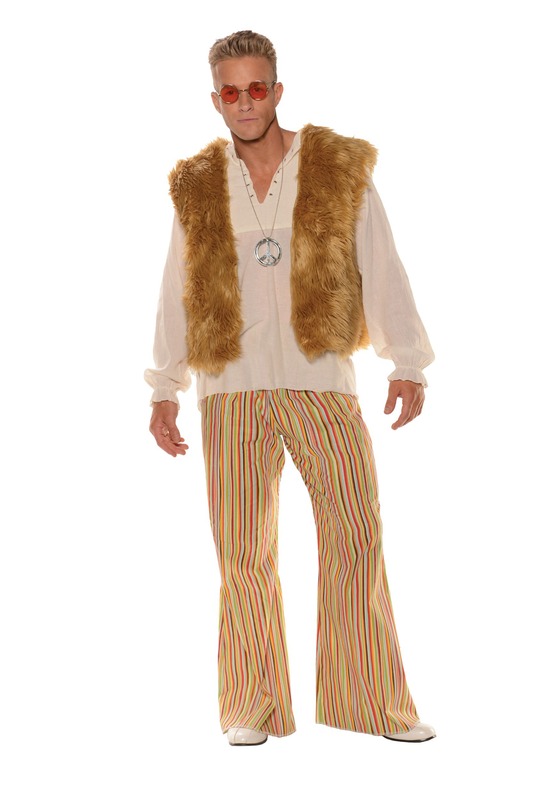 The Men's Plus Size Sunny Hippie Costume is also perfect for anyone who wants to represent an era that everyone wishes they could have been a part of. That's why you'll be the life of the Halloween party when you wear it. Just don't forget to check out our wide selection of hippie accessories to complete the picture!